After months of trying to take leave, Curtis was finally granted permission to leave Oahu for a full 3 days. You better believe that we took full advantage of those 3 days and fit in as much as we could! 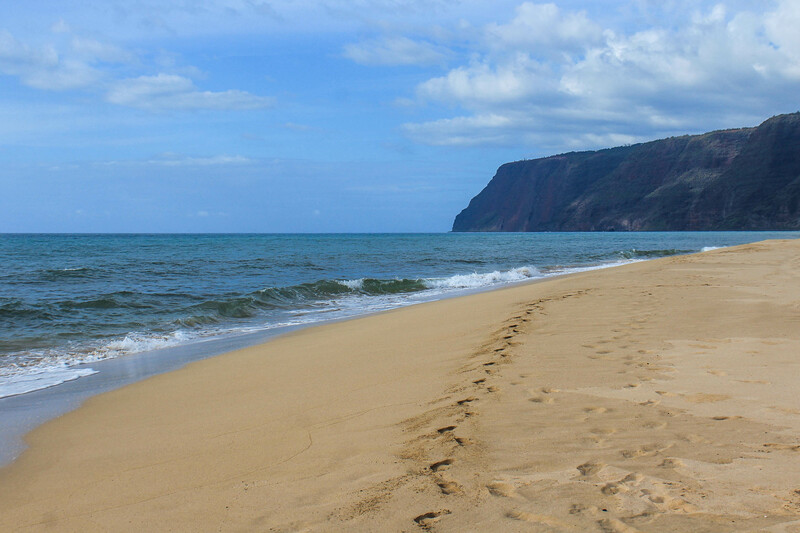 For our second island hop, we were considering both Kauai and the Big Island. After making lists and considering both the cost and the amount of things we wanted to do, we determined that Kauai would make a better 3 day trip. Most of what we want to do on the Big Island requires lots of driving and long hikes, and right now what we really needed was a relaxing vacation. 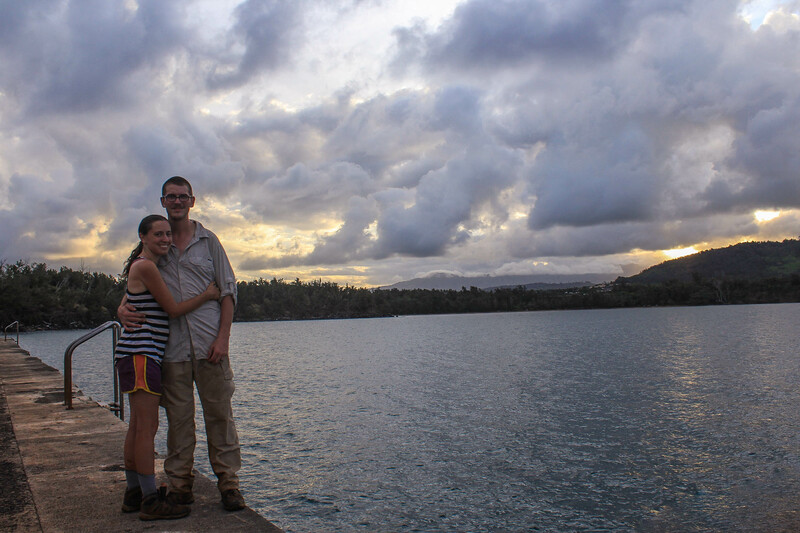 With Kauai, we felt we could fit in everything we wanted to do and still have time to relax with just 3 days. (After reading this itinerary, you may conclude that our definition of “relaxation” still sounds rather exhausting, and you would be correct in this assumption!) This post will summarize our entire trip and what we did each day, and upcoming posts will go into detail about the trails we hiked. We left HNL at 5AM on Sunday, August 12 on a mostly-empty flight, regretting our seat selections the entire time as the sunrise was better from the opposite side. The flight was so short that we didn’t bother with requesting to move across the row, we just craned our necks the whole time to see the bright red light begin to fill the sky. Less than 30 minutes after take off, we were transported to a new island, an unfamiliar place with all new mountains and no skyscrapers or interstates. But most importantly, a new county! (Curtis took all of getting off the boarding tunnel to update his map). Just like our trip to Maui, our vacation started with a quick stop at Walmart for food, then we set out to begin experiencing the Garden Isle. We started by heading North to Wailua. Curtis suggested that we start with a short hike, but I had a few drive-by spots on my list that I wanted to hit while it was still so early. 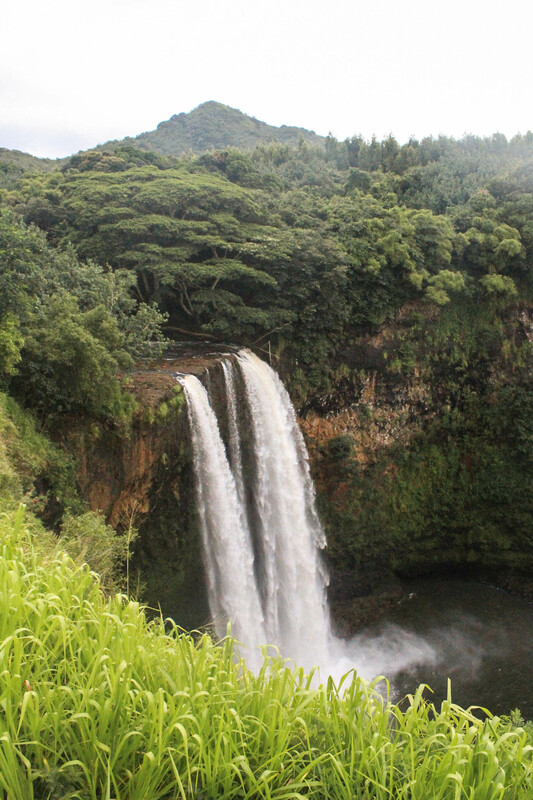 We started at Wailua Falls, which is a 4 mile drive off highway 56 on HI583. Curtis had his doubts when I told him it was a waterfall beside the road, but it proved to be worth the stop — especially this early in the morning, when we were the only ones here. The falls were beautiful, though a bit obscured by the walls guarding the steep drop off from the lookout. The surrounding area has many of Hawaii’s typical “Do Not Enter” signs that signify that an awesome hike begins right there. We weren’t even tempted though, because we know there are plenty of legal hikes that we could enjoy instead. Our next stop was a few more miles up 56 off of HI580 in Wailua River State Park. 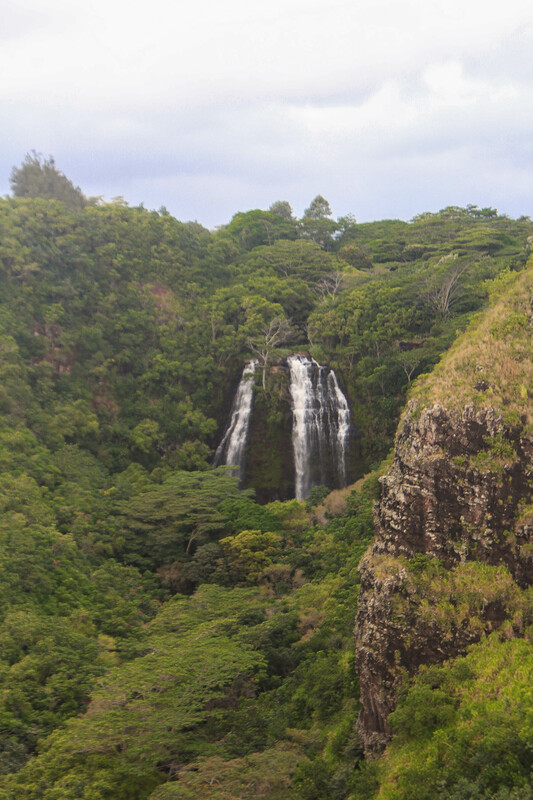 Here we enjoyed the empty lookouts for Opaeka’a Falls and the Wailua River. Curtis also found his first letterbox in over a month, so this trip was already off to a great start! We then ventured just a bit further North to go for our first hike: a pleasant jaunt up Nounou Peak, also known as Sleeping Giant. After our hike, we decided it was time to drive in the opposite direction to the Southern side of the island. The road was busier than before, and we were glad we had gotten an early start for these popular attractions. The drive between Wailua and Waimea was about an hour long, and here we encountered our first rain shower of the trip. I had been following the forecast around the island in the days prior to our arrival, and was disappointed that it looked like it could be rainy the entire time. However, we received hardly any of that predicted rain, and we soon realized that the weather reports here were similar to what we’ve grown accustomed to on Oahu: It is likely to always be raining somewhere on the island, though for the majority of the time the rain will be focused on the mountains. 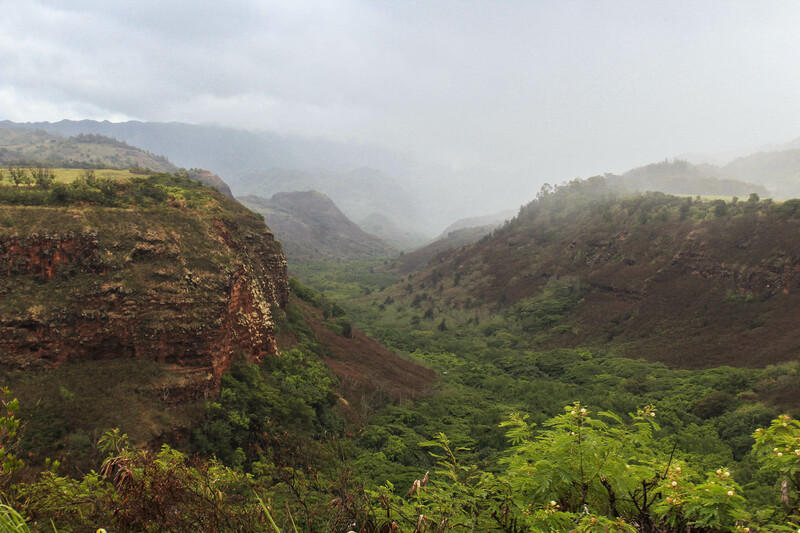 Kauai receives more rain than Oahu (they don’t call it the wettest place on earth for nothing) but that mainly falls on the high peaks in the center of the island, Wai’ale’ale, Kawaikini, and the Alaka’i Swamp. As we made our way to Waimea, we stopped at the Hanapepe Lookout to get our first peak into one of the deep canyons carved by all the rain from Kawaikini. It was filled with clouds and mist, giving it a mysterious look. I hoped that the views further up the mountains wouldn’t be as obstructed by clouds though. We continued driving through Hanapepe and Waimea, then took Koke’e Road in Kekaha up into the mountains. The clouds disappeared and the scenery was drier and more desert-like, much like the Southeast and Southwest side of Oahu. As we rose in elevation, we noted how much it was starting to look like Arizona — if you ignore the big blue ocean in the rear view mirror! The next morning, we hiked back up and continued driving up Koke’e Road, all the way to the end. We stopped a few more times for different overlooks, then went for a hike in Koke’e State Park. 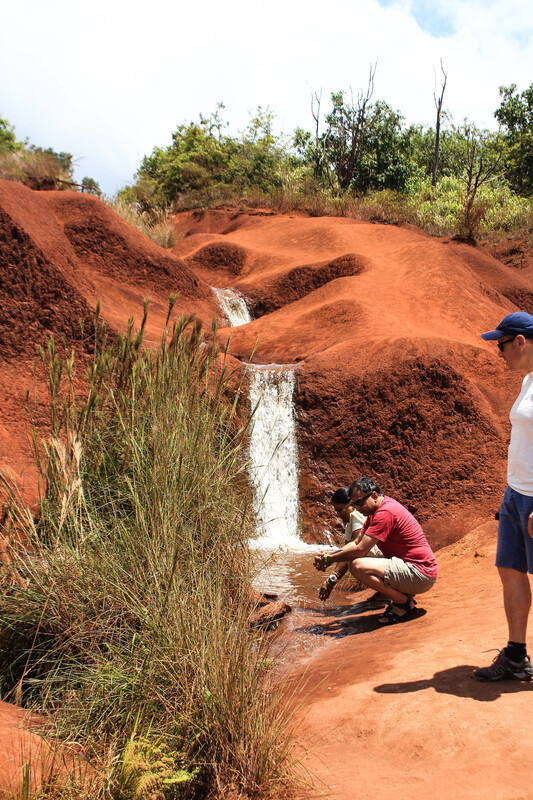 Once we were satisfied with our time here, we drove back down to sea level, this time taking Waimea Canyon Road and stopping to see the crowded Red Dirt Falls along the side of the road. Once off of Waimea Canyon Road, we made a short stop to check out Fort Elizabeth, a Russian Fort right off the highway in Waimea and on the coast. 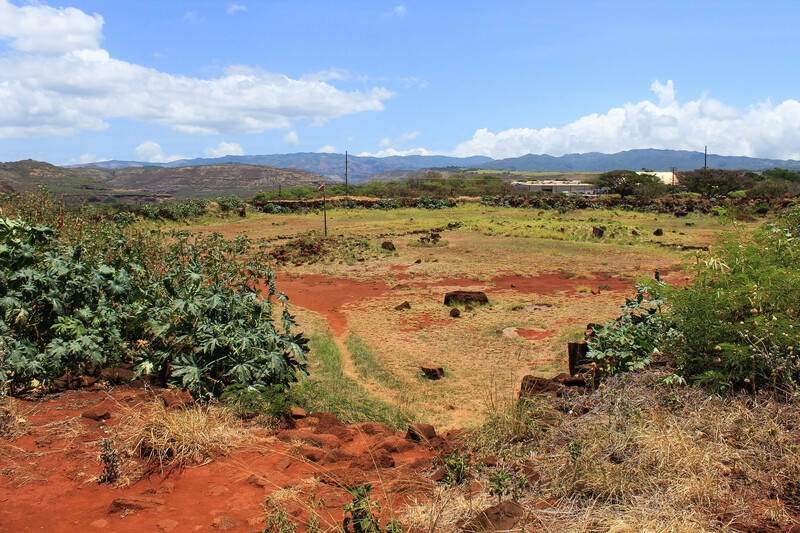 Our next order of business was to drive to Kalaheo to obtain a camping permit for a county park that evening, then we drove back to Hanapepe to check out the historic district. 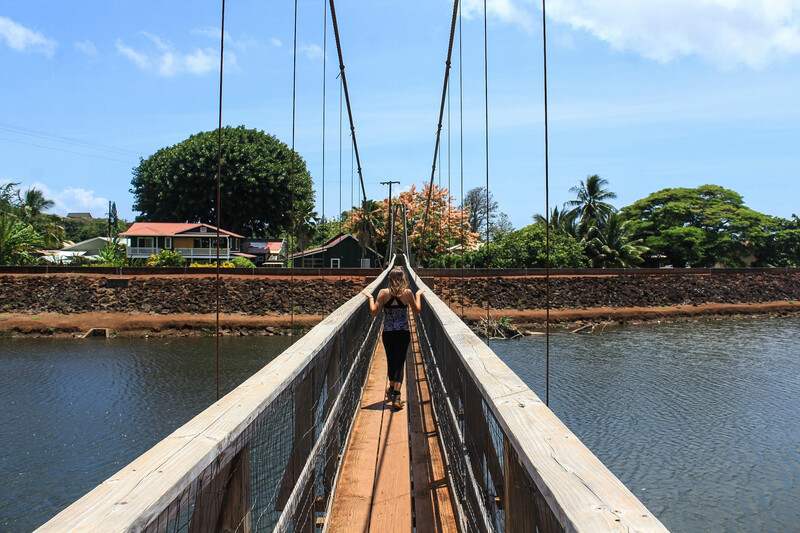 We stopped to see the Hanapepe Swinging Bridge and walked through a spice shop, then decided we could take our hunger no more and found a local spot for lunch: the Paina Pono Cafe. The staff was very friendly and appreciative of our business and we both enjoyed our meals — I had the chicken with guava rum sauce which was delicious, and since they serve typical Hawaiian plate lunches our meals came with rice and macaroni on the side which makes for a filling meal at a good price. We thought about going to set up our tent and just relaxing at the beach for the rest of the day, but the beach where we were camping was hot and busy so we decided to drive around some more. This kept us both occupied and in the air conditioning — we kept wondering why it felt so much hotter here than we were used to on Oahu, and concluded that it was because we’re accustomed to the Windward side which is cooler and windier as the name implies, and the Southern sides of the islands are typically drier and hotter. 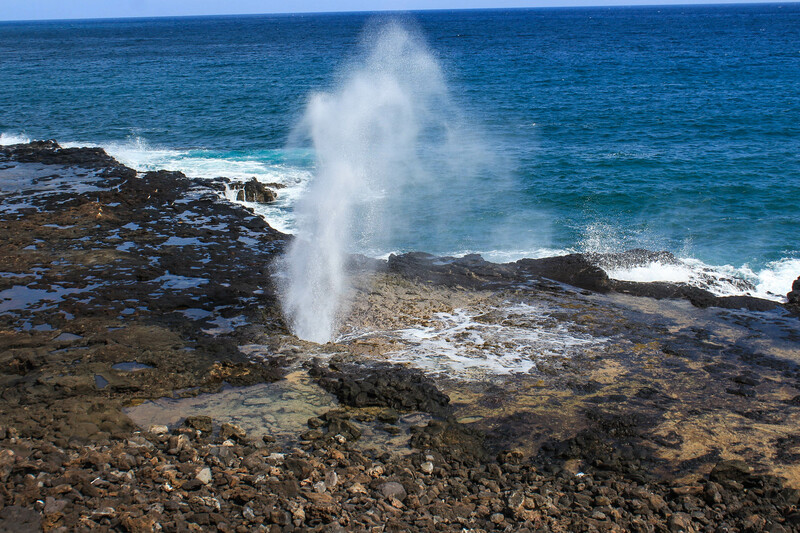 We drove to Koloa first to see the Spouting Horn — this was something I had seen recommended several times as an easy drive-by attraction and without further research I assumed it was just like the Halona Blowhole on Oahu. As it turns out, not only does it have a large active blowhole, it also makes a loud noise as the waves crash and pour out the spout — hence how it got its name. The area was pretty busy with people and vendors, but it was still worth a stop. There was another hike near Koloa that we wanted to do, but decided it would be best to save it for early the next morning rather than in the heat of the afternoon. With still several hours until sunset, we decided to just start driving West. We knew that the highway ended at Polihale State Park, which supposedly has unimproved roads and some rental car companies don’t allow taking cars there. However, ours hadn’t said anything against it, so we decided to try. As it turned out, we were just fine to drive our little Nissan on the gravel road, which was nothing like roads we used to drive in Arizona. We made it to the state park and went for a little walk on the beach. There were hardly any people there, everyone spread out so the area felt vacant, and we enjoyed the views of the tall cliffs in the distance. Finally, we drove back to our campsite for the night at Salt Pond Park. It was still busy in the early evening, but eventually the beach goers and sunset chasers left and we were able to get a good night of sleep right next to the ocean. The night couldn’t have been better for camping — not only did we enjoy the sunset and sunrise on the beach, but also had incredible views of the cloudless night sky, and were able to see the Milky Way, Mars, Venus, Jupiter, and Saturn. It was the best night view we’ve had in a long time! On our final day on Kauai, we drove back to Koloa to go for a hike which took up most of the morning. We were glad we had gotten an early start, as it was already becoming uncomfortably hot by the end of the hike. We decided to seek out some indoor activities for the midday hours, and ended up at Koloa Rum Co. just West of Lihue. We knew they offered a free rum tasting, and since rum is Curtis’ favorite we just couldn’t pass it up. The bartender made the 20 minute tasting both fun and educational, we learned about the decline of the sugar industry on the island and how they created their award-winning rum. They are 100% local Hawaiian company and offer tastings every day all with the purpose of sharing their products with more people in hopes that they will refer more people. If you’re over 21 and interested in free activities on Kauai, we definitely recommend this tasting! Not only did it get us into an air conditioned room for a half hour, but we also got free drinks on our Kauai vacation — score! The Koloa Rum Co. is located right next to the Kauai Plantation Railway and a few other restaurants, shops, and a Luau, so we walked around for a while afterward. We made our way back up to Wailua for lunch at Tiki Tacos. At first we intended to drive all the way up the North Shore, but the traffic was heavy stop-and-go so we gave up and turned onto a random road that led into the mountains. If we ever have the chance to go back to Kauai, we will focus more on the Northern side. Currently, even if traffic had been better, we could only drive as far as Hanalei before the road is closed to locals only because of severe flooding last spring. Instead, Curtis suggested we do one last hike that he had found thanks to letterboxing, and it ended up to be the perfect way to end our time on the island. The last item on our agenda was to find some lilikoi chiffon pie — something we had seen advertised often but none of those shops were open when we were passing by. We ended up finding it at a restaurant in Lihue called Hamura Saimin. It was pretty good, and inspired us to get more creative with our Hawaiian foraging finds. 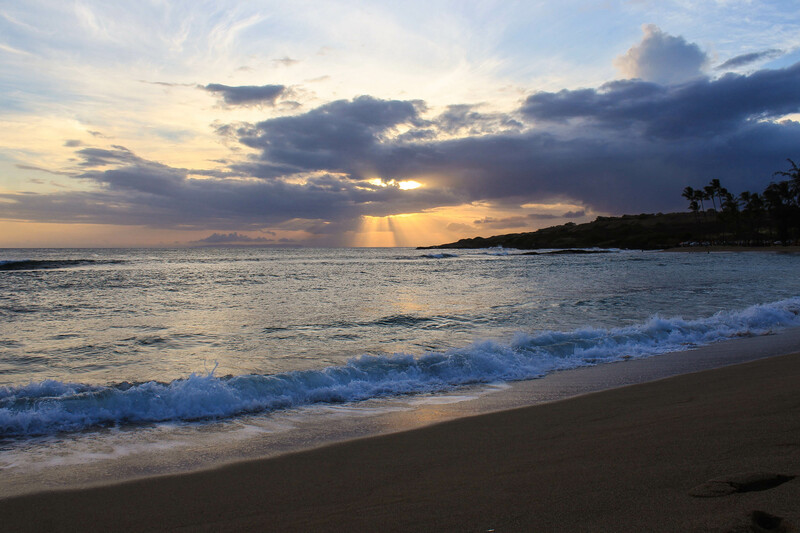 We ended our trip by watching the sunset at Ahukini Recreational State Park which was nearby the airport. The sunset was incredible with bright purple and yellow streaks through the sky. We then said goodbye to this beautiful island, turned in our rental car, and waited for our 11PM flight back to Oahu. We made it home by midnight, and 6 hours later Curtis was off to work. Perhaps we overdid ourselves on this trip — the hot sunny days took a lot of energy out of us — but we are so grateful we had this chance to see a new island and glad we made the most of every minute!